Excellent condition in every way. Has always been in Freshwater. This Californian has 3 staterooms with queen beds in both the master stateroom and the forward cabin. The middle guest room has a slide out settee. The 3 heads each have sparate shower stalls. The large salon and galley are equipped with deep sinks, electric stove, convection oven, refrigerator/freezer with ice maker and microwave. Washer & dryer are located in the middle guest room. This motoryacht has Twin driving helms. One in the salon and one top deck which is also an air conditioned area. 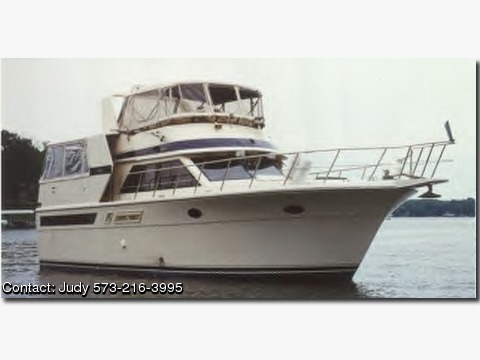 Aft deck is air conditioned as well for a total of 4 tons of central air throughout. 20 KW Kohler Generator and automatic Maxwell anchor. The large aft deck is equipped with large teak table and chairs for 6 people, bar and new beverage refrigerator. This vessel is spacious, both on the exterior deck and interior cabin areas. New bottom paint in June 2006. At that time we had a survey for our insurance company completed.